Fully interactive charts for all devices. Touch events & mouse wheel also suported. No dependency or any 3rd-party plugin required. Highly customizable & extendable components. Trial version is free to use for as long as you want. All features included. VobcoCharts is highly adaptable and upgradable library which ensures cross browser & device compatibility. Since all code is written in TypeScript, it is well structured and easily readable. It also uses Dependency Injection for better component customization. Without reload. Add and/or remove panels on the fly. Our charts offer you one of the best comparisons view by showing multiple time-based panels in single chart area. Whether you wish to compare between multiple entities or just get a cross view of single entity through specific conditions, you can use our add indicator feature. All panels are automatically synchronized by selected time frame. Each panel has it's own value axis. With VobcoCharts, you never have to start from scratch. Our gallery of live examples, specified in demos area, has charts and examples with full source code to help you get started in a minute to create your graphs. You have possibility to try yourself to modify source code and run it to see changes immediately. 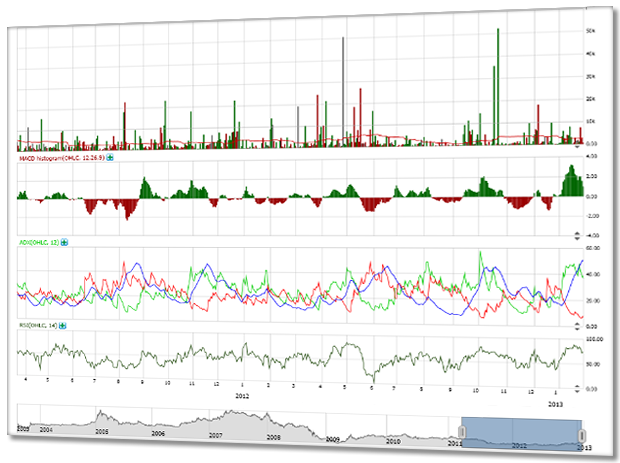 With our tutorials, you are able to learn how to customize charts for your needs. There are also advanced customization options described. See the available API reference for better understanding and full customization options.